A practical, hands-on cookery book that makes it as easy as possible for parents, grandparents and carers to have fun cooking with a toddler aged 1 to 4 years old. Everything in Tickle Fingers is completely toddler appropriate with minimal need for adult intervention - no hobs, no sharp knives, and no raw meat - and has been carefully selected to emphasise all the activities toddlers love to do: squishing, sorting, mixing and pouring. 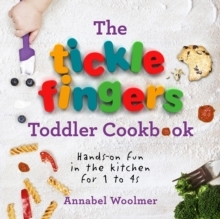 With 60 step-by-step recipes for all the family to enjoy, special sections on allergies and fussy eating, and lots of ideas on how to tackle common challenges, The Tickle Fingers Toddler Cookbook is full of simple yet delicious food that every toddler will be proud to (almost) make on their own.